Other B4A v5.80 has been released! Discussion in 'Android Questions' started by Erel, Feb 22, 2016. I'm happy to release B4A v5.80. 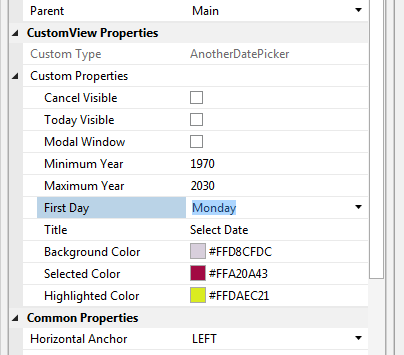 With this feature it is much easier to add and configure custom views. This attribute makes it simple to exclude classes not required from libraries such as google play services. Allows creating XML resource files from the manifest editor. Debugger improvements and fixes. Mostly related to larger projects. Coarse location permission added to BluetoothAdmin. Required for discovery in Android 6. The default setting of the holo theme in the manifest editor was removed. It is recommended to use a custom theme or the device default theme. The compiler will issue a warning about explicit usage of the holo.theme. The WYSIWYG designer defaults to material theme on Android 5+. The READ_LOGS permission was removed from LogCat object. It is not useful since Android 4.1. The compiler will issue a warning if the targetSdkVersion is missing or if the value is not between 14 to 22. ViewsEx library - Includes two views implemented as custom views (Switch and RatingBar). The source code of this library is available in the custom views tutorial. View.Parent - Returns the view's parent. OkHttp and OkHttpUtils2 libraries are included. Other minor IDE improvements and bug fixes. Developers who are eligible for a free upgrade will receive an email with upgrade instructions. sorheim, FireDroid, Levit and 50 others like this. And how to download it after I've paid for it? Just getting better and better with each new release. Thanks Erel. lemonisdead and Claudio Oliveira like this. lemonisdead, Claudio Oliveira and Peter Simpson like this. I already received this email. I've downloaded the installation file, executed it and after it was started it didn't ask me for the new license file. I checked the version and it still 5.50 but not 5.80. Then I opened the folder where I installed it and the b4a.exe file has date 11/11/2015. I then tried to install it into different folder - the same result. I've formatted my Pc, how can i download the program? The download link is the same for everyone who's eligible for it, so I believe you've downloaded the right installation file, but is running another one from version 5.50. Check again the file you've downloaded. Make sure you're running the right file. Johan Schoeman and Descartex like this. And see what it is - it's version 5.50. Cableguy, Claudio Oliveira and lemonisdead like this. Claudio Oliveira and lemonisdead like this. Well, @DonManfred ... I'm afraid he hasn't. Please remove the link from your post! Roger Daley, Claudio Oliveira and lemonisdead like this.